My husband served his apprenticeship in a sign shop as a Pictorial Artist. As well as doing signs, he did display work. Back in those days the large billboards were all hand painted. 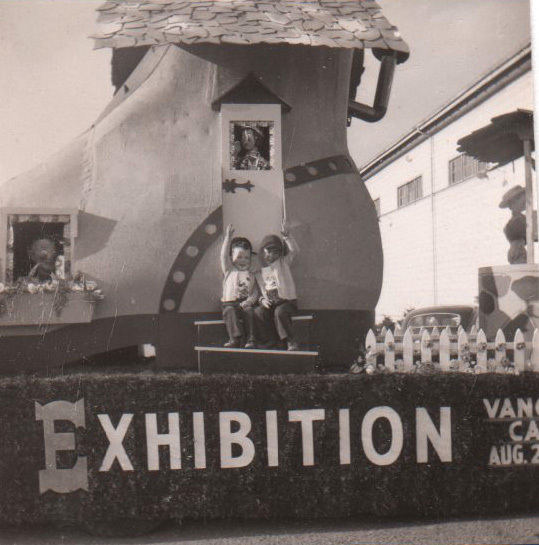 He designed and built floats for the PNE (Pacific National Exhibition.) As I was going through the “oldie” pictures, I came across “The Old Woman Who Lived In A Shoe” with Ra and Danny waving as they pretended that they were in the parade. That float, built in 1954, won a prize, and toured around to many other parades, including one in Seattle. 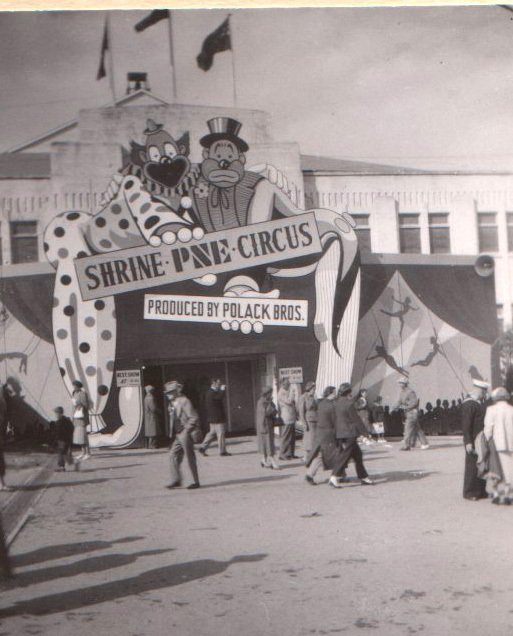 They needed a sign for the entrance to the Shrine Circus that would be at the PNE that year. There was a contest to find the design that would be used. Some pretty fancy sketches were submitted. On his lunch hour, Mickey drew his idea on a brown paper bag and submitted that… and it won. He had the job of building the sign. I don’t remember what the prize was! Now why would I write about the PNE in January, when it actually occurs late in August through until Labour Day in September? A couple of reasons… it had the kids posing on the float… and January 3rd is my husband’s birthday. and Mickey must be a very artistic and talented man! Now I see that your son Danny got his drawing talents from both his Mother & Father.Yes,I looked at his flickr stream and saw his art work and was blown away by his talent! That Marilyn Munroe picture was outstanding! Almost life like! Thanks for all your lovely stories Norma.I love reminiscing with you! Your stories are always so interesting! Have a wonderful day.Keep shining my friend! A lovely tribute to your husband! Beautiful work – love the shot of the boys waving. Have a wonderful day, a poignant one for sure. Welcome, Heather. How nice to share a cup of tea with you… no cookies, thank you… too many lately. Thanks for your comment, you know that I really appreciate it. Happy Birthday, indeed, Mickey! Memories live forever, and so do those we love. Wonderful photos and great memories. What treasures you have. Thanks for sharing them. Dianne, thanks for coming by and your comment… always appreciated. Jean, nice to have you visit, and commenting, too. Join the group for tea? Judith, thanks for your visit and your comments. I’m pleased that so many of my flickr friends seem to be enjoying my trip down memory lane. I hope it sparks some of your memories as well.